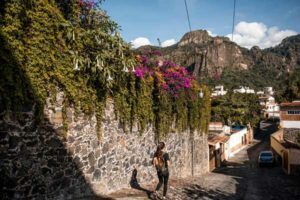 Tepoztlan, a mystical town in the Morelos State of Mexico was a place my husband Duncan and I had not heard of until we were offered a housesitting assignment there. It’s a good thing we have Google today. Tepoztlan is now one of our favourite places in Mexico and one that we will return to one day soon. 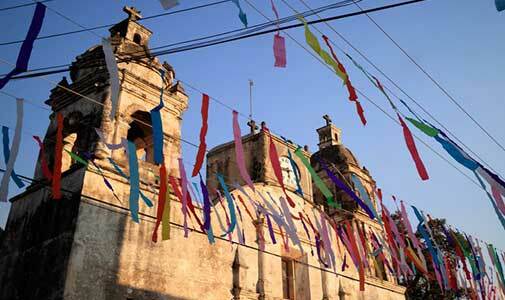 Tepoztlan has been designated a ‘Pueblo Magico Town’. It’s one of several Mexican country towns classified as ‘magical’ owing to cultural and historical treasures and was declared a UNESCO World Heritage Site in 1994. Tepoztlan is a small, cobble-stoned village about one-and-a-half hours from Mexico City. It’s a sleepy spot—that is until the weekend arrives. The it comes alive as the weekend market draws visitors from all around who descend on the town to enjoy the bars, restaurants and markets and, for the more energetic, to trek up to the Tepozteco Pyramid. On the weekend a few streets around the church in the middle of town close to traffic for the market. Here, stallholders sell everything from the local ice cream (which you must try) to clothes and handicrafts. Join the queue outside the green market for the best fish tacos and fried fish in town freshly cooked from a local food truck. Don’t forget to add their special chilli sauce, but not too much—it’s got a kick. Looming over the town is the Aztec Tepozteco Pyramid. It is a steep climb to the top but well worth it, the view is amazing. There is a small entrance fee of $4. Watch out for the small coatis (members of the raccoon family) they are always looking for food and can be quite menacing. Tepoztlan is quite hilly, a good place to work on your fitness level and the cobblestones are a good reflexology treatment for your feet. When you want to unwind, the town has many spas, mediation and healing centres. There is a mystical feeling as you wander through the streets where aromas of lavender and other various healing oils fill the air. If you enjoy yoga, there are classes and retreats in and around Tepoztlan. If you can’t make the weekend market, aim for the Friday Organic Market at La Sombra del Sabino restaurant located at 45 Revolucion, Barrio de San Jose. Our favourite brunch dish is the Eggs Benedict and strong local black coffee. Here you can also buy locally grown fruit and vegetables, home made breads and cakes, local Mexican food, wine, aromatherapy oils, clothes and jewellery. Tepoztlan is not short of good coffee shops, all offering good, strong WiFi, they are the local hangouts for the expats who have come to live there from all over the world. There are many health benefits living in Tepoztlan, from clean fresh unpolluted air to fresh water direct from the mountains and a very relaxed lifestyle. The local green market is very popular with all the residents and sells fresh food, meat and bread. At 5 p.m. you will hear call of ‘pan’ as the locals ply the streets with baskets on their heads filled with the freshly baked bread and cakes from the many local bakeries. You will find small tiendas (corner stores) at the end of each street selling a small range of grocery products, local beer, milk, eggs and flowers. A young boy would knock on our door selling three avocados for $1.40, his mother hiding behind the gate, making sure that the sale went through. Each barrio (neighbourhood) has its own church which means many fiestas throughout the year and lots of fireworks at all hours of the day. Tepoztlan has certainly earned its reputation as a ‘magic’ town.